Socialism is a deception. If you look at every major area of importance in America where Christianity was once prominent and had influence, history shows truth has been replaced by lies. We will be able to raise more awareness and fight more effectively once we realize the fact that the United States of America is under siege from within by anti-Christian promoters of immorality. Until we acknowledge the enemy, we will just keep on buying what they’ve been selling. So let’s start with some questions: Did you know that even though the cold war ended, Communism did not die or even fade away when, thanks in part to Ronald Reagan, the Berlin Wall came down in 1989? Did you know America was infiltrated by socialists, progressives, and communists? Socialism is a natural and necessary step in order to achieve Communism? Strong, biblical churches and informed, active citizens are key obstacles to resisting socialism in America? America nearly had a Communist Vice President in 1944? The environmental movement began and environmental extremism emerged because world Communism failed? The agenda enacted by communists and Marxists in America over the last 75 years was largely financed by the Soviet Union? 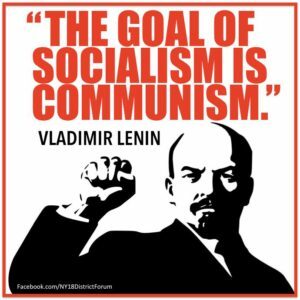 The American Left and our own government today has continued to carry out those original Communist Goals? A plot to take down the United States? No way. ‘It could never happen in America’ – right? Enemies of God have done quite a good job convincing us through the years that there was never an agenda against this country. That’s conspiracy theory material, they say, insisting the cultural, economic, and moral deterioration we see of America has been natural and inevitable. But our culture has been compromised, and that they have purposefully achieved their objectives in part through America’s major institutions. In the last 25 years, radicals and yes, communists, have been emboldened by allies in our government. Some historians suggest socialists began slipping into the White House just prior to Reagan’s presidency during the Jimmy Carter administration. Communism went down in Germany, but it wasn’t out for the count. In fact, former insiders agree it was the Obama administration that dramatically sped up the ‘fundamental’ transformation of America from a free Republic under God into a socialist style global nation. Two of today’s most dangerous internal threats to America, threats that were once unthinkable, are Communists and radical Muslims. Consider the fact it’s been years since the government and media have been critical of socialism and Islam. Prior to being elected president, half of the country didn’t seem to care that for most of Barack Obama’s life, almost every friend, associate, and mentor of his had a Marxist or Muslim background. Were there communists in his past as well? In December 2016, CNN announced controversial activist, Van Jones, would host a new show, “The Messy Truth.” Now a political mouthpiece for the left, CNN doesn’t care that Jones was asked to resign from the Obama administration in 2009 after Glenn Beck reported on his communist ties. Describing how he evolved from a “rowdy nationalist” to an admitted communist, “trying to be a revolutionary,” according to Van Jones, “I met all these young, [really] radical people of color… communists and anarchists,” he explained. Jones has regularly smeared conservatives, law enforcement, whites, and public servants. And now it’s now part of his job as a “political commentator,” you know. Author, blogger, and commentator, Michelle Malkin has been exposing left-wing radicals for over a decade, and declares both CNN and the Obama administration knew all about his record before they hired him. Jones obviously didn’t ‘accidentally’ slip through the cracks of vetters. If they were at all concerned about his past, why would CNN promote him with his own show? He rose to public prominence as a race-baiting agitator at the Ella Baker Center for Human Rights in Oakland, funded by the George Soros-supported Lawyers Committee for Civil Rights Under Law, the liberal Ford Foundation and the Rockefeller Foundation. He became a public fixture in the Bay Area after crusading to free convicted cop-killer Mumia Abu-Jamal for a Marxist organization and lambasting moderate civil rights leaders for objecting to politicizing the classrooms. So many people to write about, so little time and space. We could expose at least two dozen former Obama administration staffers, but the purpose of this chapter is to provide an overall picture of this anti-American movement and the progress that has been made in specific areas. I was first reminded about the influence of communism in 2010 when the left held the Madison, Wisconsin Capitol building hostage during protests against Governor Scott Walker. Their failed recall efforts and election cost Wisconsin taxpayers millions of dollars, I saw protest signs featuring the blue clenched fist, and tables set up for the Socialist Party of America. Signs for the Communist Party USA were visible, union power on full display, cries of solidarity, ‘Walker is Hitler,’ as well as all the typical chants of “shame.” Democrats loyal to the NEA encouraged teachers and students to skip school to join the protest – on taxpayer dime, of course. You may not have read about protestors shouting down Republican representatives, blocking doors of the building not allowing them entrance, and tens of thousands of dollars in damage during their rebellious display of mobocracy. This is not and never has been a game to these people. We have been seduced by socialist ideology resulting in a more secular society where man is god, government manipulates outcomes, and the State is provider. Christians are not immune from the influence of this entitlement worldview that leads to the deaths of economic stability, biblical morality, and accountability in government. In the appendix of Milton Friedman’s 1980 book, Free to Choose, he stated that most of the 1928 Socialist Party platform of Norman Thomas was already part of the federal establishment in America in the eighties when President Reagan began his tenure. Some Democrats give lip service and distance themselves from the word “socialism,” but continue marching the country in its direction. Americans under 30 however, are embracing socialism as recent polls have shown. Similarly, these same people generally reject capitalism and the free market system. According to one survey, only 16 percent of millennials could define socialism as government ownership of businesses (the means of production and distribution of goods). But since socialism is often depicted as a fair and compassionate system, many young people view it favorably, including 43 percent of Americans under thirty according to a 2016 poll. Though Hillary Clinton was always the champion of the left and expected to win the Democratic nomination for president, there was quite a competition at times thanks to Vermont Senator, Bernie Sanders. It sure made that race interesting. Even in states such as Iowa, Democrats backed Sanders including 84 percent (nationally, 72%) of those under thirty. The “democratic socialist” came away with nearly 12 million votes in the primary to Clinton’s 15 million. The media has been veering to the left for decades, but it was quite revealing when during a debate with Sanders, MSNBC’s Rachael Maddow asked Hillary Clinton if she is “too far to the right” for liberal Democrat voters. To them, ‘the right’ means just left of the political center. It doesn’t help matters when people tend to focus on the promises of socialism rather than the bloody history and destruction left in its wake. Many millennials don’t have a clue about the Cold War or the collapse of the Soviet Union’s “evil empire,” because it occurred before the oldest of them were out of diapers. In more recent years, soft totalitarianism (the confiscation of people’s taxes and seizure/control of the media and private companies) has characterized socialist-led regimes in South America including Argentina, Brazil, and Venezuela, where once-vibrant economies are struggling. People debate world economics all day, but one thing is undeniable: during the 20th Century, Communist governments murdered over 150 million people, with Lenin and Stalin leading the way. Apparently, both of these brutal dictators were greatly influenced by Karl Marx. Before we get to goals from over fifty years ago, communism is basically a theory advocating elimination of private property; a system in which goods are owned in common and are available to all as needed; a totalitarian system of government in which a single authoritarian party controls state-owned means of production. Government ownership and control means lack of freedom for the people, who are essentially employees of the government. Citizens of a communist nation are told where they can live and in what government housing since no one can own a home, business, etc. In theory the people share everything equally. In practice, those in power, the government or “State” has ultimate control of everything and those in charge live lavish lives off the backs of the people. There is no incentive to work hard because everyone shares equally and if you put extra effort to produce something it is taken away and given to others. People have no say on legislation and there is no choice of political parties. The Communist Party is the only ruling authority and elections may be held only to select one Communist leader over another. Since they don’t allow for free thinking or faith in God, the belief is there is no Moral Authority and the primary religion is atheism. It’s no wonder history has demonstrated people will risk their lives to flee from Communist countries to go to a country where there is freedom. Regardless of the destruction, enslavement and starvation of people, economic disaster, oppression, and murder, there are some today who fail to identify Communism as the cause. Regarding the goals below, you may ask where I got them and how do I know they are real. These Communist Goals were actually read into the Congressional Record (Congressional Record–Appendix, pp. A34-A35, January 10, 1963) during a session in the House of Representatives. The goals are from a 1958 book by former FBI Agent and university professor, W. Cleon Skousen, The Naked Communist. Another book was published in 2011 by a Christian man, James C. Bowers, called The Naked Truth (The Naked Communist – Revisited). This book is an analysis of the goals and how they have been implemented or achieved. Bowers reminds readers to keep in mind that Marxists have been successful at breaking down our culture as a step to socialism. For most of these goals, no follow-up commentary is needed as they are self-explanatory. We could estimate that between thirty and forty of these goals have been accomplished if not fully implemented. Evil doesn’t sleep and will not relent. Look at how far this nation has fallen! Satan knows his days are numbered and his time is short, but do we understand what this means? In The Naked Truth, James Bowers details most of the goals listed above and he comes to several conclusions at the end of his book. I wholeheartedly agree with him that one reason we are where we are today has to do with the apathy and busyness of Americans over the past several decades. We’ve pursued happiness, we’ve gone to work, established careers, taken care of the kids, perhaps attended church, and we’ve quietly minded our own business. Tragically, over the years, Americans have accepted the ridiculous adage that has allowed the left to gain so much ground: ‘it is not polite or proper to discuss religion and politics.’ Think about it; what two topics could possibly be more important to talk about? While many of us were criticizing Christians who did talk about these things because they were getting “too political,” those dedicated to changing this nation into a socialist state kept their collective feet on the gas pedal. How much of the progressive agenda has been achieved ‘under the radar’ so to speak? David Horowitz, is an author, professor, and former Communist who used to fight as a radical for the Left until realizing how dangerous the extremists were and how the Democrats and Socialist Party of America chose to remain in denial. His biography describes his slow reaction to the atrocities of communism worldwide including the Soviet Union, Viet Nam, Cambodia, and Indochina, eventually causing a mass exodus within the Communist Party USA. However, the most agenda-driven, defiant, faithful travelers have always remained loyal to the cause. At the beginning of this chapter, I mentioned that America nearly had a Communist as Vice President. There have been times in our history when we nearly went off the cliff but were miraculously spared. One of those periods was 1944 during which America had a close call according to Bower’s father who worked as an Army officer during WWII. His father managed an airport in Indiana, and one day received an unexpected visit by the Army Chief of Staff. At the time, progressive-minded advisors, politicians, and newspaper editorial boards encouraged him to use more power due to the critical economic situation in America. Roosevelt’s wife, Eleanor, also suggested America might need the leadership of a “benevolent dictator.” The term “dictator” did not carry the negative connotations it does today, and some saw the situation as needing a political “general” to lead the battle against the depression. FDR chose to attack the depression with his so-called New Deal, a series of economic programs passed during his first term in office. These programs greatly expanded the size, scope, and power of the federal government, giving the President and his Brain Trust near-dictatorial status. … Roosevelt used the FBI and other government agencies to spy on domestic critics. He also authorized the use of the American Legion to assist the FBI in monitoring American citizens. FDR was running for a fourth term in 1944 and in an incredibly rare move, he decided to drop Vice President Henry Wallace from the ticket, perhaps due to rumors many Americans were becoming skeptical of them. For whatever reason, after three terms working together to expand government power, Roosevelt replaced Wallace with Harry Truman as his VP running mate. Like Roosevelt, another progressive president in U.S. history that believed the Constitution to be a living, “breathing,” changeable document was Woodrow Wilson. Some consider Wilson a leader of the progressive movement in the early 1900s, preceding FDR by twelve years. A former New Jersey Governor, Wilson was the first president to dramatically increase the size, scope, and control of the federal government. As for the Great Depression, the decade of misery lasted much longer than it needed to and certainly longer than the economies around the world. Many believe the policies of FDR’s “New Deal” made things worse including extremely high unemployment, inflation, and rationing. There are major differences between the philosophies of conservatives and liberals, but many of the big government programs are run by advocates of progressivism. One in particular was created with good intentions, but even the Communists may not have dreamed this government agency would be one of the greatest weapons in their arsenal: the Environmental Protection Agency (EPA). They turned a legitimate agency into a tool used to suffocate and smother businesses and industry with endless regulations. In 1970, the Democrat-controlled House and Senate passed an environmental bill that became known as the National Environmental Policy Act (NEPA) which President Richard Nixon signed into law, eventually deciding to consolidate the jobs of different federal agencies. The EPA was born. Unfortunately, radical environmentalists are now using the Agency to impose regulations that threaten property rights. Admittedly, we did need to change some habits and clean up air pollution and water problems fifty or more years ago when there was not much of an environmental focus. Though there have always been extremists, most concerned citizens were correct in lobbying for and supporting necessary laws to prevent pollution and to clean up the country. But good things are often abused by agenda-driven ideologues. That same year, the EPA expanded their control over virtually every waterway in the country, from major lakes and rivers to the smallest ponds and streams on farms and private property. CNS News reported that since President Obama was elected in 2009, 3,373 rules and regulations were published by the EPA covering greenhouse gases, air quality, emissions and hazardous substances, and others. Need a comparison or a visual? The regulations issued by the Obama administration contain 23 times as many pages as the Bible and 46 times as many words. For example, the Gutenberg Bible is 1,282 pages; the new EPA regulations equal 29,770 pages in the Federal Register. At the time of this report, the Obama administration was passing an average of two regulations per work day. The EPA regulations have more than double the number of words as the massive Obamacare regulations, which have 11,588,500 words and are 78 times as many words as the Obamacare law itself, which contains 381,517 words. It should come as no surprise that over the course of Obama’s presidency, the EPA has greatly expanded its regulatory overreach, and so have many other federal agencies. Although solid proof was difficult to find, the signs seemed obvious and suspicions were rampant that communists had entered the highest levels of the U.S. government. If academia was infiltrated back in the 1930s and 40s, why would we be surprised they got into government as well? If we have both spiritual and physical enemies and they want to destroy America, there really isn’t much that should surprise us as far as goals or methodology. Here’s what many of us still have a hard time explaining: regardless of how free, how great the quality of life, and how successful individuals, businesses, or America as a whole were at any given period in history, there have always been dissenters and rebels in every generation. This nation has been arguably the most influential force in improving the world for good rather than evil. We have been the most compassionate and generous country in history and yet, because so many believe the propaganda and do not know true history, they hate us. But perhaps it is much simpler than that. We’re expecting people who don’t know God and do not know our history to appreciate America. What is the one primary benefit of living in this nation and the very reason patriots and pilgrims arrived on these shores to begin with? Freedom. And what is our first freedom? Religious freedom. This is the very reason people in other countries want to come here to live. It is one reason why some people love the idea of America’s way of life, and out of envy, others hate us. East and West Germany were obvious examples of fascism on one side and freedom on the other. How about North and South Korea? (If you have never seen this stark contrast, try an Internet search for the Korean peninsula at night, then click ‘images.’) The communist north is one of the poorest countries in the world and the people sadly have zero freedom, zero productivity, and Christianity is illegal. Just across the well-fortified border in the south however, is one of the more prosperous, free, Christianized nations; and the main difference is their systems of government. Do you care about free speech and the ability to preach the Gospel of Jesus Christ? Then you must also care about politics. If we are not part of the voting process and we avoid politics thinking we need to just focus on preaching the Gospel or helping the poor, we are indirectly allowing the left to elect liberals and progressives to pass laws restricting biblical morality. As a result of certain laws, the government then prevents us from sharing the good news. With government involvement, Christians might be allowed to provide some food for the poor, but their most pressing spiritual need will go unmet due to “church and state” restrictions on free speech. Many of us have taken life in America for granted. We’ve enjoyed exceptional blessings, but we’ve lived our lives enjoying liberty in this country without continuing to fight to maintain our freedoms. On the other hand, the left has been working this whole time and we are now experiencing a period in this nation our founders – or our great grandparents – would have never imagined: a time when God has been rejected, truth has been redefined, and our religious freedoms are at stake. VERY illuminating. I’m 80 plus and have always wondered how the left was able to gain so much clout. Knowing something was wrong., but what to do about it. ALL THE while, the mover and shakers remained hidden trom view. Dang It! Now what? Well articulated Dave, as always. Thank you for staying on top of these issues so well through the years, and sharing with others. Thanks so much, DeAngelo! (smile) Always great to hear from you. It is exhausting at times, but we do all things through Christ. My new book is at the publisher being edited by the way. (Redefining Truth) God bless and stay in touch! I appreciate the kind words, JP. This country sure has changed, but God has not. Let’s keep trusting Him who was and is and is to come!